Horseradish is a perennial vegetable/herb grown for its pungent roots, which are used to spice up a variety of dishes from roast beef to cocktail sauce to a Passover Seder Plate. The leaves can also be eaten, when young and tender, but should not be eaten by animals. There are many medicinal uses for horseradish. Leaves: The dark green leaves are long, ovate, and somewhat puckered and rough. They grow in a basal rosette. Flowers: Small, white four-petaled flowers are produced on long stalks. You can see the resemblance to other Brassicas, like cabbage and broccoli. Spring-planted horseradish roots will be ready to harvest in October or November. In frost-free climates, winter harvest is recommended. Harvest roots in the fall, ideally after the first frost. 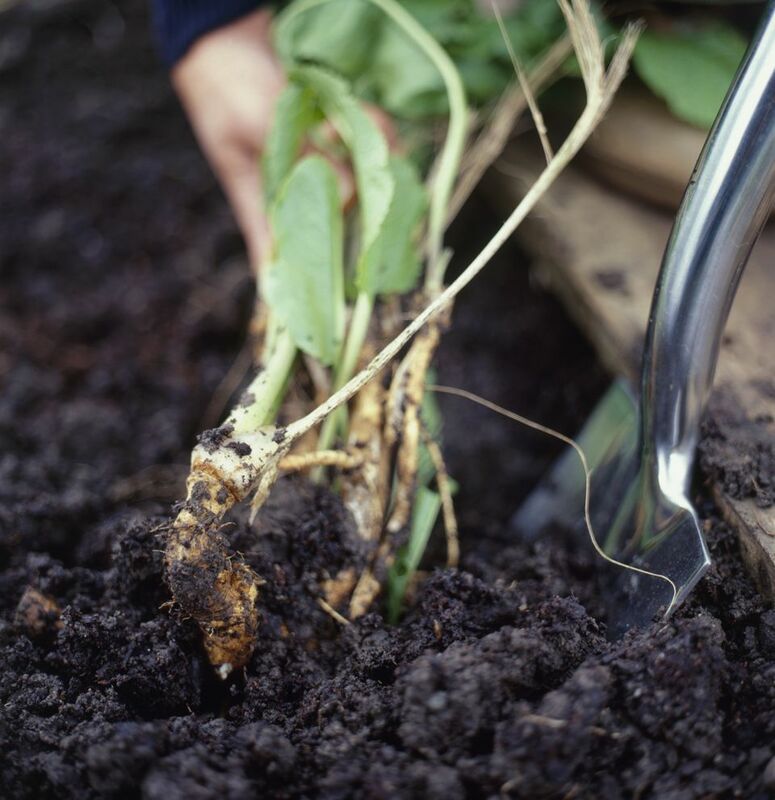 Dig around the base of the plant and lift the large, central root and as many of the smaller roots as possible. If you are growing your horseradish as a perennial, you can leave some in the ground and harvest as needed. Just keep in mind that the more broken pieces left in the ground, the more plants you will have. If you are growing it in a pot or as an annual, lift it all. Common horseradish may be the only variety you will find. There is also Armoracia rusticana 'Variegata', which is more ornamental, with marbled leaves. Horseradish plants are perennial in USDA Hardiness Zones three to nine. Since you will be harvesting the roots, however, this might not matter. If you want your horseradish to return the following year, you will need to leave some root in the ground or save it to plant next year. Saving it is often the preferred method because horseradish can become aggressive. For the healthiest plants, grow your horseradish in full sun to partial shade. Few pests will bother the roots of horseradish, but there are several that will feed on the leaves, including aphids, beet leafhopper, diamondback moth, flea beetles, and imported crucifer weevil. The aphids can be washed off. If the other pests become a nuisance, consider growing your horseradish undercover. Soil: Horseradish likes a slightly acidic to neutral soil pH of about 6.0 to 7.5. A loose soil rich in organic matter will produce the best roots. Grow it in the ground as a perennial and allow it to spread. Grow it in a container, where you can control it. Grow it as an annual, to get larger but fewer roots. Horseradish has long taproots, so well-prepared soil is important. Prepare the garden bed by turning in a couple of inches of organic matter. A prepared bed is extra important when growing plants as perennials because you won't be able to correct your mistakes later. Horseradish is grown from pieces of root that are about the diameter of a finger and 12 to18 inches long. Horseradish will spread, so you won't need more than one or two plants to feed the whole family. Dig a hole about six to eight inches deep and one foot apart. Hold the root at a 45-degree angle with the crown, or large end, toward the top, at the soil line, and the small end at the base of the hole. Backfill the hole to cover the crown of the root with two to four inches of soil. Then water the plant well. Horseradish is not a demanding plant, but you will get better quality roots if you keep the soil well watered, so the roots do not get woody, and feed or side dress your plants every three to four weeks. If you are worried about horseradish taking over your garden, growing it in a container may be the option for you. You'll need a sizable container, with at least a 30-inch depth for the roots to grow in. Plant the roots the same as if you were planting them in the ground. Container horseradish will need more frequent watering and monthly fertilizing. To get large roots like the ones you purchase in a store, you might want to experiment with growing horseradish as an annual, focusing on getting one large root, rather than many smaller roots. First-year roots tend to be the most pungent. You will still need to start with a bed prepared with lots of organic matter and plant the roots as directed above. As the plant starts to grow, it will send up multiple shoots. Each shoot is forming small roots and taking energy from the plant. To get one large root, remove all but one or two of the shoots and allow them to grow larger.